Owing to the fact that they appear as real as natural teeth and last for a lifetime, dental implants have gained popularity over the years as the preferred option for replacing lost teeth. A dental implant is an artificial tooth root that is placed inside the jawbone, allowing a crown to be attached on top of it. Implants are made of titanium which has a natural affinity to bone. Because of this, new cells are able to grow and attach themselves to the implant over time. Clearly, there are great reasons to choose dental implantation. 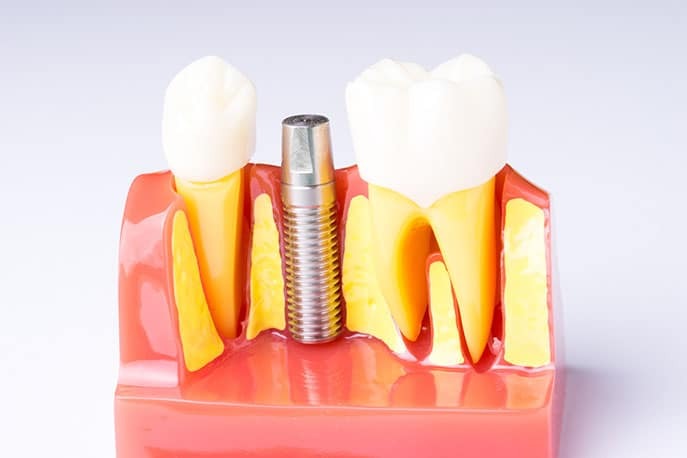 While dental implant surgery is minor, it is nevertheless precisely planned right down to the tiniest details. Your dental surgeon has a very clear picture of what goes where, as he has all the required imaging done beforehand to determine placement of the artificial root. Because all the placement details are mapped beforehand, there is an impossibly tiny possibility that something could go wrong. Also, your dental surgeon has probably done the procedure tens of times before and this experience should be reassuring to you. Believe it or not, dental implant surgery is not all that different from a tooth extraction. Some will even say that implantation is easier than extraction. If you have ever undergone a tooth extraction, you will likely undergo the implantation just as easily. Your dentist only needs to numb the area they will be implanting the root, and the surrounding areas, and within a few minutes you will be good to go. However, if you are nervous about remaining conscious during the procedure, your dentist can provide a sedative or anxiety-reducing medication. There’s very little tissue disruption that happens during implantation, and this is because of the advancements in implantation technology. Also, the incised tissues are usually stitched with self-absorbing sutures. What you’ll need after the procedure is some painkillers (usually a mild non-steroidal anti-inflammatory drug) and to take care that you don’t exert that side of your jaw, and you’re good to go. After the implantation surgery, your dentist will advise you to allow time for bone integration. This is usually a few weeks. After this is complete, the dentist will attach a permanent crown on your dental implant and thus will begin your journey of a functional and permanent smile. It is important to hold candid discussions with your dentist before you undertake your implantation surgery. This offers an opportunity for you to share your fears and concerns and have these allayed by someone who has undertaken similar procedures before. Remember to be honest and share openly, so that your dentist can respond honestly as well.